Develop 5 acres of green space that supports 10,000 people atop a freeway that cuts through the center of one of the nation’s largest cities? Sure, we can do that. What would it take to construct a “lid” over Woodall Rodgers Freeway for a deck park? In late 2005, that question left Carter Burgess engineer Tom Shelton scratching his head. After conducting some feasibility studies, however, Shelton changed his mind. He joined a core team of players who helped convert a concrete hole into what many hope becomes an iconic centerpiece for Dallas. Every public-private partnership is uniquely structured, and the park’s is no exception, with three owners: the Texas Department of Transportation, the City of Dallas, and The Woodall Rodgers Park Foundation. Add in two general contractors, Archer Western and McCarthy Building Cos., and that’s a lot of hammers in the tool shed. Somehow, it worked. “We’re a team that tries to think of everything,” says Keith Bjerke, a consultant who serves as project manager of the park. In June 2006, the Foundation unveiled landscape architect James Burnett’s park design, which incorporated feedback from public input sessions held at the Nasher Sculpture Center earlier that year. During the concept phase, design plans for the park, which runs from Pearl to St. Paul streets, weren’t grandiose. Many envisioned a green space for people to throw a Frisbee or walk the dog. But when private fund-raising took off, donors asked if their money could go toward a children’s area or other specific feature. The park’s design bloated with amenities: a performance stage, a restaurant, water features, a children’s garden, botanical gardens, a dog park, and lush landscaping. Amenities like performance stages and trees are nice, but they weigh—a lot. Before laying the first support column, structural engineer Mir Hadi Ali needed the big picture from designers so he could calculate how much the amenities would weigh. The equation included factors like the weight of 322 trees at maturation, 904 shrubs, equipment, soil, park attendees, and even rainwater. The weight load on the deck was drastically reduced by using geo-foam, which is like a dense Styrofoam, and engineering lightweight fill wherever planting soil wasn’t needed. As a comparison, geo-foam weighs 1.8 pounds per cubic foot and the lightweight fill weighs 65 pounds per cubic foot; regular soil weighs nearly double that, at 120 pounds per cubic foot. The deck uses 200,000 cubic feet of geo-foam, which weighs 180 tons, versus 12,000 tons for soil.The majority of the structure that supports the park is concrete. There are no steel beams. Designing a deck structure that could support that weight across a 200-foot wide freeway posed a huge challenge. There were only so many places to put support columns, so general contractor Archer Western constructed them behind the existing walls in most areas. A center support was built in the middle of the freeway, says Jacobs Engineering Group’s Ali, who is engineer of record for the park. This project is unique because it’s a bridge, but it’s not a bridge, says Ali, who describes it as a combined bridge, park, and tunnel design all in one. Creating an accessible urban park with-out barriers or step-ups was a mission early on. Engineers wrestled with this challenge, as they wanted to match the grade elevations for the park with the frontage roads. They had to maintain a minimum vertical clearance of 16 feet-6 inches under the deck, but standard concrete TxDOT beams would raise the park too high. They chose shorter, pre-stressed 54-inch concrete box beams that could bear the load and not impede the freeway design. The structural beams in the deck structure also served another purpose. Designers wanted the tree roots to grow underground, but needed room for the root-balls to properly grow. The beams were arranged in groups of three or more, and concrete panels were placed between the beam groups to form trenches. The 100 trenches act like planter boxes and accommodate not only the tree root-balls, but fiber optic cables, water and gas lines, and telephone and electrical lines. Because the trees are trenched on a grid, the landscaper had to map out every tree in the park much earlier in the design. But even though the trees are planted on a grid, it doesn’t look that way because the walkway is curved, Bjerke says. Root repellent helps control the trees’ growth, which could damage the structure and cause cracks. A drainage mat, located between the deck structure and the soil, draws excess moisture to the landscaping. The park has a slight tilt to it, so any excess water drains off into the storm sewer system. If the trenches fill up from excess rainwater, large geo-foam blocks anchored to the deck will help displace the water, Ali said. Archer Western also waterproofed the beams to prevent water saturation, which can cause weight issues and eventual damage, says Bill Hale, TxDOT’s Dallas district engineer. With the design complete, it was time for TxDOT to award the contract to build the structure. But the project hit a snag because much of the funding raised at that point was designated for the actual park—not the deck. Even though TxDOT kicked in $20 million for the $51 million project, there was still a $16.7 million gap, as construction costs were rising. After President Obama took office, his first initiative was the American Recovery and Reinvestment Act, established to provide federal funding to transportation projects to get people back to work. Shelton prepared the application and worked closely with elected officials. By March 2009, the $16.7 million check was in hand. In August 2009, TxDOT awarded archer Western, an Atlanta-based company with a regional office in Dallas, the $44.5 million contract to build the park deck and tunnel. Archer Western built the retaining walls and began installing the first of 316 cross beams in October 2010, celebrating the kickoff with a picnic for donors and the public. It took a year to install the cross beams, which were placed in tandem by two cranes aligned on either side of the bridge. TxDOT only allowed 20 highway closings for the project’s duration, mostly on nights and weekends, making it even more difficult to complete the work, Bjerke says. TxDOT’s Bill Hale, who has been involved in the project since 2005, says coordinating Arts District and American Airlines Center activities, such as concerts and basketball games, created ongoing scheduling challenges for the freeway closures. On closure days, he would wake up at 6 a.m. to check that the lanes were reopened in time for rush hour. During construction, TxDOT closed the eastbound Pearl Street exit as a safety measure until the beams were placed.Once the deck was covered, it converted from a depressed open expressway into a 1,200-foot long tunnel. The tunnel classification meant complying with a whole new set of rules from the National Fire Protection Association. Mid-project, a code change resulted in a “$1.5 million surprise” that wasn’t originally budgeted, Bjerke says. To comply, the project required a 1.5-inch fireproofing layer on the bottom of the structure and on the new central wall. The tunnel design also includes sprinklers and 28 jet exhaust fans, which would protect it and the park from fire in the case of an accident or crash. From the park, the massive fans aren’t visible, but drive through the well-lit tunnel and it feels like you’re driving on an East Coast freeway. The jet fans serve another purpose. If there’s excessive traffic in the tunnel, a carbon monoxide system will trigger and turn on the fans, Bjerke says. Traffic flow and crosswalks were also addressed early on in the project. If all of the streets were left in place, the area would be divided into three separate parks, making it difficult for patrons to safely visit each venue. The goal was to close Harwood street to through traffic to alleviate the problem. In addition, 18-foot-wide, enhanced crosswalks with improved markings were planned so patrons could walk to adjacent parking garages, as parking is limited on the street. “At the end of the day, it really increases the functionality and operations of the park,” Shelton says. Woodall Rodgers Park Foundation chose McCarthy Building Cos. to handle construction of the park’s amenities. The general contractor is no stranger to high-profile Arts District projects; the AT&T Performing Arts Center and the Dallas City Performance Hall are evidence of that. McCarthy’s work at the park is what brings it to life: the children’s area, performance stage, landscaping, fountains, and Thomas Phifer-designed restaurant, plus 65,000 square feet of paved plazas, walkways, and seating areas. McCarthy, which began construction in June, is used to working in wide, open spaces, not overpasses. The close quarters and weight and loading requirements required the company to reduce the amount of material and large equipment it could transport at one time. Field trips to similarly programmed parks like Bryant Park in New York City and Millennium Park in Chicago gave designers an inside look at how they’re managed and the amenities they offer. They also offered insights into how to provide security, handle trash, graffiti, and any homeless issues. Building from scratch afforded opportunities to include many sustainable design features. Bjerke says the park project is registered for LEED certification; his goal is for it to achieve silver designation, one of the highest classifications, by November 2013. The park’s LED light poles are wrapped in solar panels and run using a high-efficiency lighting management system, which results in annual savings of about 94,000 kilowatts of electricity. No need to worry about germ-infested fountain water, either. The five water features use a water reclamation system and double purification systems that reduce the use of potable water and help dispose of dirty water. These systems daily save about 18 bathtubs of water. The 11,000-square-foot café and restaurant, which are likely to open next summer, also will use geothermal energy for cooling and heating, high-efficiency light fixtures, and recycling materials. The park also has systems in place that allow organizers to bring in executive-style portable washrooms (like those typically found at the Byron Nelson golf tournament) for special events. A 15-foot-by-50-foot generator sits at the east side of Pearl Street, backing up the tunnel and providing emergency lights to the park if the power fails. Most people won’t notice this massive generator, however, as it’s camouflaged with trees and greenery. Some say a park on top of the freeway never would have been possible without former Dallas Mayor Erik Jonsson’s foresight in the 1960s. He asserted that the 1.61-mile freeway should run below ground level in a trench. 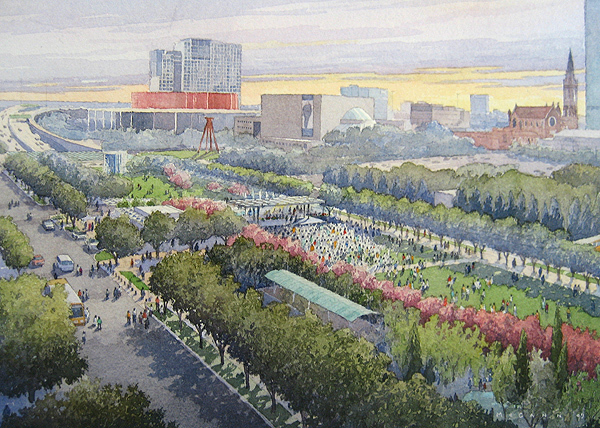 Could Jonsson have envisioned a green space like Klyde Warren Park decades before its time? “The covering the freeway notion—why it went down instead of up—has been out there in city lore for some time,” says attorney Rob Walters, vice chairman of the foundation’s board. John Reynolds, who has worked with Dallas’ Parks Department for 26 years, helped perform due diligence on the park project in 2005. That was a year before $20 million was voted on and allocated to the park through the city’s 2006 capital bond program. Smaller city projects, like the 2-acre Main Street Garden, strive to transform parking lots into green spaces. But aside from Fair Park, Klyde Warren Park is one of the parks department’s largest public-private partnerships. Some surrounding neighbors took some convincing that the park would be an asset; but they’re now enthusiastically on board. “They’ve become our biggest advocates,” Shelton says. Aside from soaring real estate values, there are other benefits, too. The park’s trees and plants are expected to ease the urban heat island effect, and help absorb freeway noise and dirty air. Bjerke says acoustic levels at the park site measured in the high 80s and low 90s before construction, but are expected to drop to 60 decibels—the same level as a normal conversation—upon completion. The reduced noise should benefit not only those in the park, but also adjacent property owners.